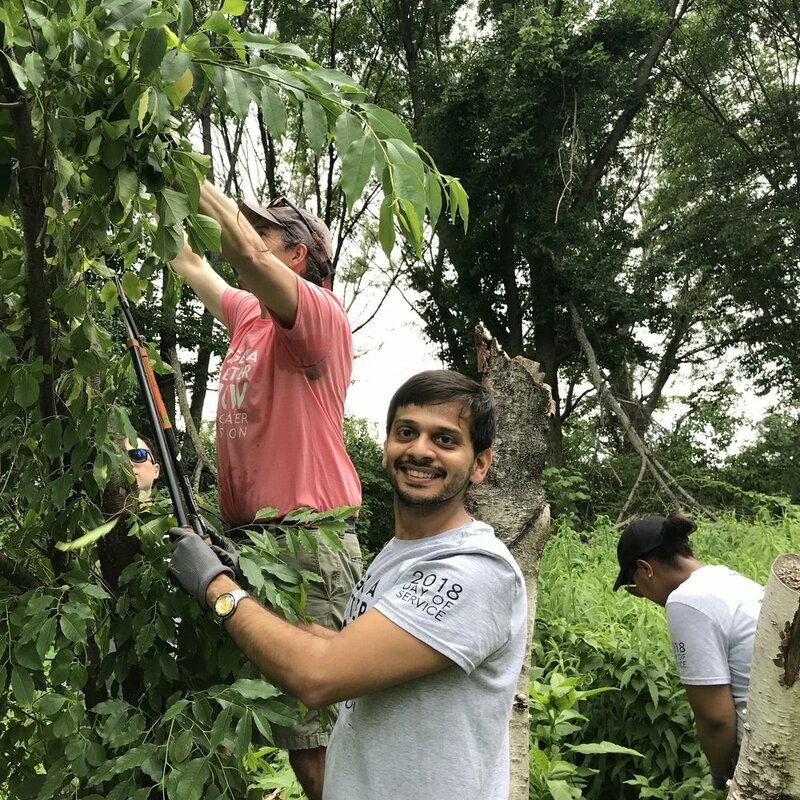 Since 2010 we have worked with corporations and local businesses to offer fun and rewarding community service opportunities along the Mystic River. Our efforts began by tackling water chestnut, an aquatic invasive weed, and have since expanded to include Oriental bittersweet removal in waterfront parks. Project partners include Biogen Idec, MathWorks, IBM, Agero, Google, BNY Mellon, Takeda Pharmaceuticals and many more. a four hour event with groups of up to 100 has a tremendous, visible effect. remove invasive plants from our parks and rivers to improve the environment. provide a fun and rewarding day for your employees. 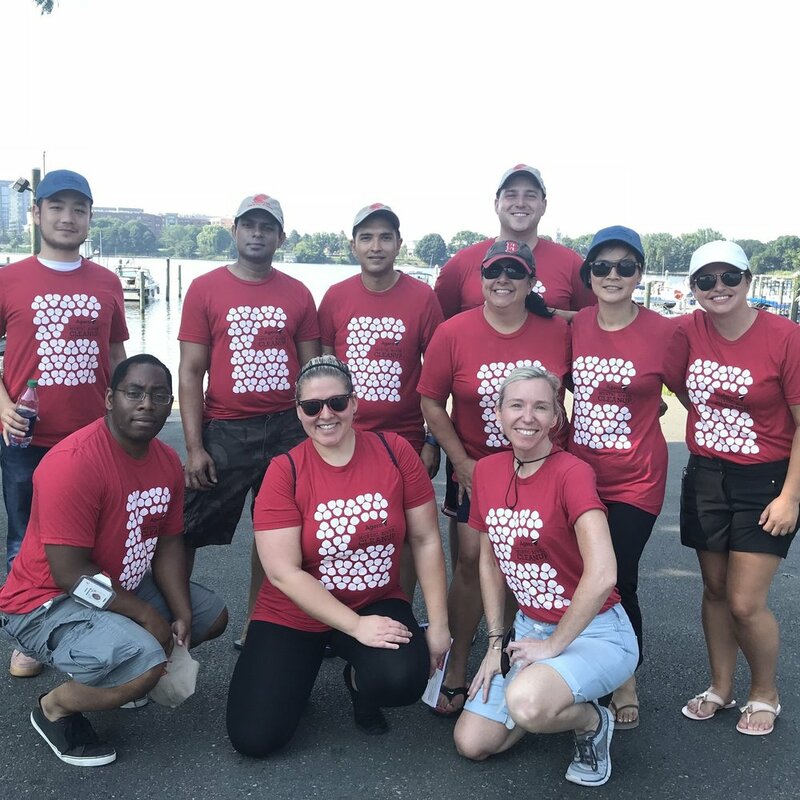 Work with us to schedule a volunteer event for your team of 10 to 100. Events run approximately 4 hours and include an orientation, time on the river/in the park, clean up, and lunch. Water chestnut volunteers rotate through both canoe and land-based roles. We recommend reserving 9:00 a.m. – 1:00 p.m., however we can accommodate a variety of schedules, weekdays and weekends. All locations are accessible by car and most by public transit. All supplies are provided. Check out the Corporate Volunteer Program brochure for more details! Park Improvements - Volunteers pull land-based invasive plants and contribute to other improvement activities in Macdonald Park in Medford. Projects run May-September. Water Chestnut Removal - volunteers get in canoes and hand-pull these aquatic weeds in various locations in Medford, Somerville or Arlington. Projects run June-September. Volunteers from Perkin Elmer helped remove water chestnuts in 2016. This fully tax-deductible donation helps to cover the costs of planning and executing our volunteer events (staff time, rentals, material removal and permitting) as well as sustaining the overall program. We are grateful for the work of our corporate volunteer groups. Thank you! For more information and to schedule your event contact volunteer@mysticriver.org or (781) 316-3438.